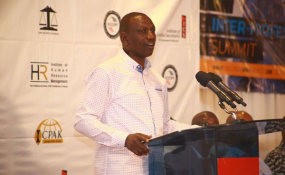 Deputy President William Ruto during the opening of a three-day Inter-Professional Summit at Pride Inn Paradise Resort in Shanzu, Mombasa County, on march 20, 2019. Nairobi — Parliament has denied the existence of a Bill circulating on social media platforms titled 'Milk Bill 2019' that purports to regulate the production and sale of milk by farmers to consumers and other third parties. The Clerk of the National Assembly Michael Sialia in statement on Friday said the information doing rounds on social media is "false" and urged the public to ignore it. "The authors of this false information are hereby warned to abstain from circulating malicious falsehoods with the intention of causing panic among Kenyans," he said.